I’m Ali and nutrition is my jam! Whether you’re looking for personalized nutrition guidance, a seasonal cleanse, simple recipes or education on eating holistically… you’ve come to the right place! I am a Board Certified Holistic Nutritionist who is passionate about guiding people to find a balance with food and educating them on how eating real foods can produce real results. I believe it’s about shifting your mindset from convenient and conventional ways of eating to keeping it simple with wholesome, natural foods. Simplicity is what it is all about! I live and teach by the saying, “Eat what God has created”. By this I mean our bodies thrive on wholesome, nutrient-dense foods that are unrefined, raised organically and prepared thoughtfully. Paying attention to the food that truly makes us feel better, allows us to fuel our bodies through a more natural approach. A few tweaks in our diet backed by education can be the difference in how we feel and look everyday. Food impacts our lives in so many beautiful ways ranging from cell nourishment to emotional, physical and social well-being. It is my belief that food is our medicine. It can help us heal from things like daily headaches to bloating, gas, high blood pressure or cholesterol, and even decelerate or stop an active disease or illness. Eating simply gives our bodies a rest from the overly processed, chemically driven world we live in. It refreshes and resets our body’s systems so they work more effectively together. By eating simply, you’ll start to see an increase in energy, get a better nights sleep, see clearer skin, have less unwanted cravings and lose the excess weight your body has been holding onto. I know it doesn’t always seem simple and that it can be confusing, misleading and frustrating but that’s why I am here – to keep it easy and most importantly, show you how simple works! It is my goal to make it sustainable for you to live fully, eat well and feel amazing! "When you reach a certain age, it comes impossible to lose weight! Nothing that had worked before age 40 seemed to make a difference. I didn’t want to accept that a slower metabolism, menopause and age were now in control. I also thought that I was eating healthy… then I started working with Ali. I WAS WRONG! With the nutrition plan she created for me, I’ve lost all the unwanted weight, my skin glows and I don’t get headaches or stomach aches anymore! It is AMAZING! I am so thankful for Ali’s guidance." My experience, programs and advice are here to help you take your health and understanding of nutrition to a whole new level. These programs are designed for you. I do not strive for myself or others to eat a ‘perfect’ diet but rather design a nutritional program that is made to match you and your lifestyle! The diet is plant-based and made up of whole, fresh foods that have all the key vitamins, minerals, proteins, fats and energy that we need to live our busy lives! It’s about taking small steps to get you where you want to be that is lasting and enjoyable! 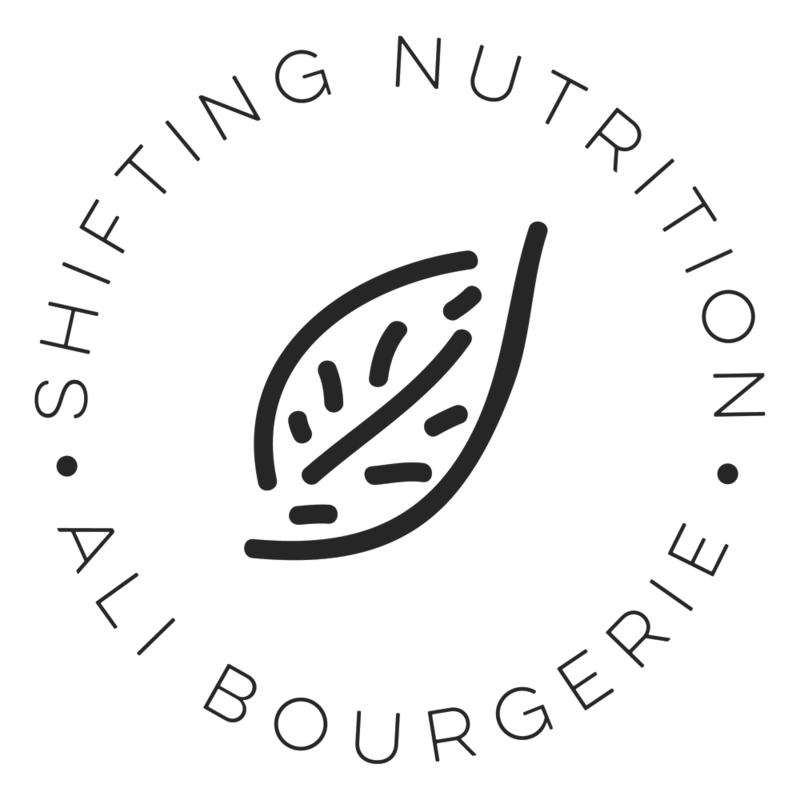 "After a serious health diagnosis, I turned to Ali to try and naturally heal my body through diet. Within in the first month, I was shocked by the results and even more surprised how simple it was to eat holistically! I absolutely have loved the meal plan Ali has come up with and am so thankful for her knowledge!" 1. Re-evaluate! What are you putting in your body? Test yourself and keep track of how much of your daily food comes from a box, jar, wrapper or package? 2. Eat mindfully. If you can’t recognize an ingredient in your food, neither can your body! 3. Prepare as much of your food yourself as you can. 4. Eat S.O.U.L foods as much as possible; ones that are Seasonal, Organic, Unprocessed, and Local. 5. Build your plate with mostly plant-based foods; 40% being vegetables, fruits, nuts, seeds, grains and beans plus 20% from protein and other sources. 6. Stay hydrated. Choose filtered water and herbal teas and drink them between meals. 7. Eat beneficial fats; from olive/coconut oil, sprouted nuts and seeds, avocado, olives. 8. Add booster foods to snacks and meals at least one time a day. Things like chia/ flax/hemp seeds, seaweeds, spices and herbs. 9. Aim for consuming 25 grams of fiber a day. 10. Limit or avoid sugars and artificial sugars. Make sure to read every label as they can sneak into anything! "I absolutely LOVED the meal plan Ali gave me! She focused on everything I needed to improve my personal health. I could tell a huge difference just after one week! Not to mention the recipes were delicious and so easy to throw together which kept me right on track and motivated to keep moving forward!"